(Lanka-e-News- 29.Sep.2014, 7.30PM) Last week (September 25th) the Sri Lanka Freedom Party (SLFP) opened its first operational office for the Presidential Election - 2015. This office at Gregory’s Road, Colombo 07 was declared open by Minister of Economic Development Hon. 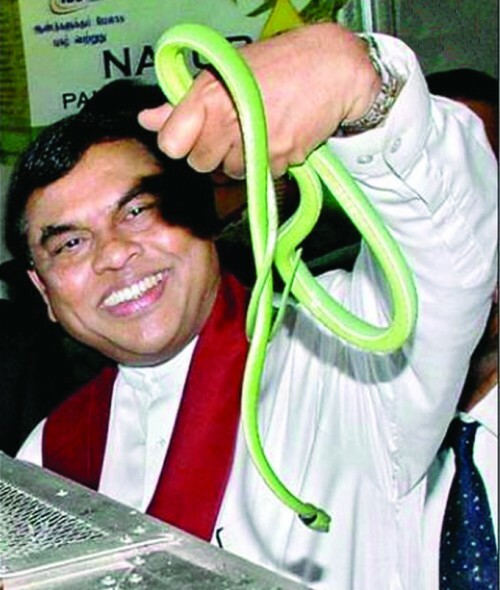 Basil Rajapaksa and a large number of senior public servants were present at the event. Secretary to the Ministry of Economic Development Dr. Nihal Jayatilleke, Chairman of the National Delimitation Commission Jayalath Ravi Dissanayake, Secretary to the Ministry of Telecommunication and Information Technology GotabayaJayaratna, Secretary to the Ministry of Ports and Highways RWR Premasiri, Secretary to the Ministry of Industries and Commerce AnuraSiriwardane, Secretary to the Ministry of Mass Media and Information CharithaHerath, and the Governor of the Central Bank AjithNivaard Cabral were among senior public servants who attended this event. However the establishment code of the Sri Lanka Administrative Service (SLAS) prohibits certain officers from engaging in political activity as such involvement is considered unethical and since these officials play a key role in the electoral process, creates an unfair playing filed. The presence of these distinguished public officers at the opening of an election office for President Rajapaksa shows that they are politically biased and this in turn creates an impression among the public that an election guided by such men will not be free and fair. In addition this type of activity encourages other government servants to actively engage in politics. In recently held Uva Provincial Council election we saw senior state officials actively engaged in campaigning for the ruling UPFA. Secretary to the Ministry of Economic Development Dr. Jayatilleke played a key role in sidestepping the Commissioner of Elections’ directives on the distribution of ‘drought aid’ in Moneragala and misleading the court regarding the same matter. Actions of such public officers had a direct impact on the Uva elections and we can but wonder the extent of his and other secretaries to the ministries possible involvement in the 2015 presidential elections. CaFFE is also deeply distressed by the presence of Chairman of the National Delimitation Commission Jayalath Ravi Dissanayake at this meeting as he is responsible for drawing the electoral map for future elections. If he is seen attending events to promote politicians, serious doubts will be cast on how impartial decisions taken by his commission is. This in turn will adversely affect the people’s confidence in elections and electoral process. Charitha Herath is the Secretary to the Ministry of Mass Media and Information, an institution that controls state media. Although state media has always been used by successive governments for election propaganda, the misuse of these institutions has increased under Herath. Meanwhile Ajith Nivaard Cabral has been promoting the current administration since he assumed duties and this marked biasedness has often made opponents of the government to cast doubts on the reports. CaFFE believes that senior government officials must not openly engage in political activity, not only because of the legality and morality but also because the negative impact it has on people’s faith in elections. We kindly request the above mentioned senior officials to refrain from participating activities to promote a candidate or a party and urge government servants to safeguard the honour of their stations by acting in an impartial manner. The Public Interest Foundation has something to go by and nip it in the bud. Will they? If such approach to the SC is mounted at a space, something will happen - the Voters WILL get educated!